One of the most complex astronomical instruments nowadays available is the Two Degree Field (2dF) system at the Anglo-Australian Telescope (AAT, Siding Spring Observatory, NSW, Australia). The main part of 2dF is a robot gantry which allows to position up to 400 optical fibers in any object anywhere within a “two degree field” of the sky. 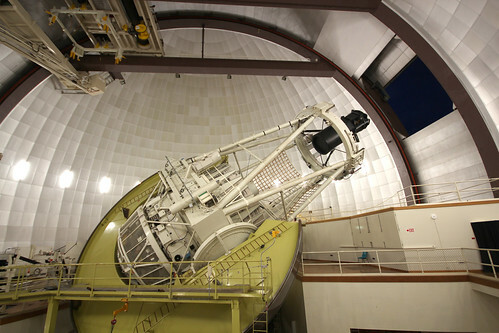 The 2dF instrument attached to the primary focus of the AAT. Note that the mirror of the telescope is opened. 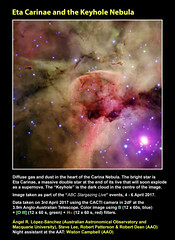 This image was chosen to be part of the Stories from Siding Spring Observatory Photo Exhibition the AAO organized last year. 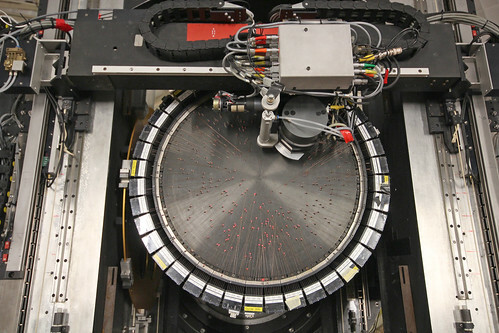 392 optical fibers are fed to the AAOmega spectrograph, which allows to obtain the full optical spectrum of every object targeted by an optical fiber. The remaining 8 optical fibers are actually fibre-bundles and are used to get an accurate tracking of the telescope while astronomers are observing that field, which may last up to 3 hours. 2dF possesses two field plates: one located at the primary focus of the telescope and another at the position of the robot gantry. While a field is being observed in one plate, 2dF configures the next field on the other plate. A tumbling mechanism is used to exchange the plates. 2dF was designed at the AAO in the late 90s and, since then, it has been used by a large number of international astrophysicists. In a clear night, 2dF can obtain high-quality optical spectroscopic data of more than 2,800 objects. Indeed, this sophisticated instrument has conducted observations for hundreds of astronomical projects, including galaxy surveys such as the 2dF Galaxy Redshift Survey, the WiggleZ Dark Energy Survey, and the Galaxy And Mass Assembly (GAMA), survey which is still on going and in which I actively participate. The optical fibers of 2dF can be also fed the new HERMES spectrograph, which is now starting the ambitious Galactic Archaeology with HERMES (GALAH) survey at the AAT. GALAH aims to observe around 1 million galactic stars to measure elemental abundances and measure stellar kinematics. 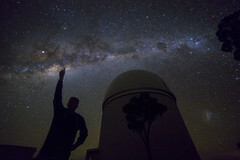 Frame of the time-lapse video “A 2dF night at the Anglo-Australian Telescope”. The 2dF robot gantry moving and positioning the optical fibers. Credit: Á.R.L-S.
How does 2dF move and position the optical fibers? A very nice way of explain it is using the time-lapse technique, that is, taking many images and then adding all to get a movie of the robot while moving and positioning the fibers. That is why in 2012 I decided to create the video, A 2dF night at the AAT, which assembles 14 time-lapse sequences taken at the AAT during September and November 2011 while I was working at the AAT as support astronomer of the 2dF instrument. 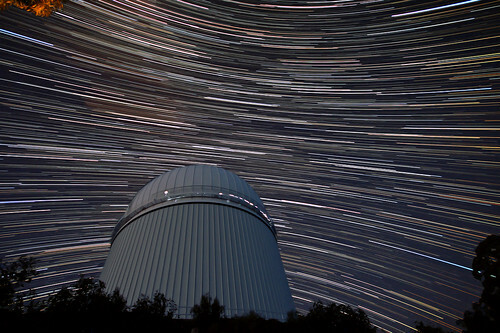 Actually, this time-lapse video shows not only how 2dF works but also how the AAT and the dome move and the beauty of the Southern Sky in spring and summer. The time-lapse lasts for 2.9 minutes and combines more than 4000 frames obtained using a CANON EOS 600D provided with a 10-20mm wide-angle lens. Time-lapse video “A 2dF night at the AAT”. I recommend to follow the link to YouTube and watch it at HD and full screen in a dark room. Credit: Á.R.L-S. The video consists in three kinds of sequences created at 24 frames per second (fps). The first 3 sequences show how the 2dF robot gantry moves the optical fibers over a plate located at the primary focus of the telescope. Although in real life 2dF needs around 40-45 minutes to configure a full field with 400 fibers, the time-lapse technique allows to speed this process. The first 2 sequences have been assembled taking 1 exposure per second, therefore 1 second of the video corresponds to 24 seconds in real life. The third sequence considers an exposure each 3 seconds, and hence it shows the robot moving very quickly. The next four sequences show the movement of the telescope and the dome. All of them were obtained taking 2 images per second (a second in the movie corresponds to 12 seconds in real life). The long black tube located at the primary focus of the telescope is 2dF. The remaining sequences, all obtained during the night, were created taking exposures of 30 seconds, and hence each second in the video corresponds to 12 minutes in real life. 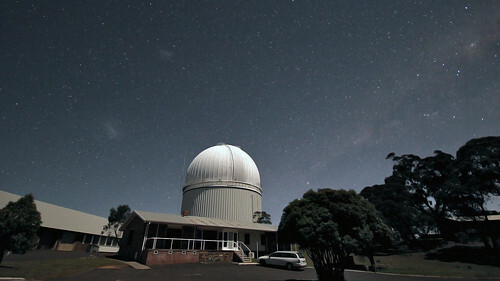 Frame of the time-lapse video “A 2dF night at the Anglo-Australian Telescope”. 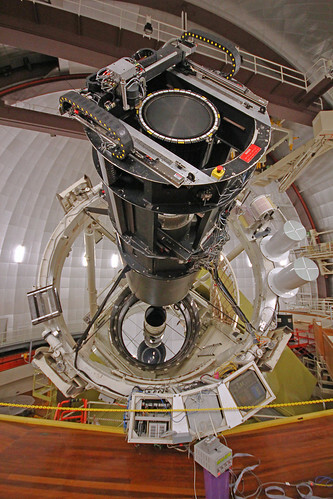 The AAT telescope, with 2dF (the long, black tube) attached at its primary focus, is prepared to start observing. 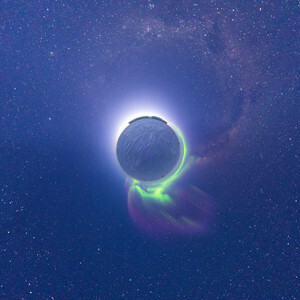 Credit: Á.R.L-S.
Astronomical time-lapse videos allow to see the movement of the Moon, planets and stars in a particular position in the Earth, something that conventional videos cannot achieve. 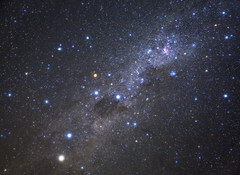 In particular, dim stars and faint sky features, such as the Milky Way with its bright and dark clouds and the Magellanic Clouds, can be now easily recorded. As in my first time-lapse video, The Sky over the AAT, I set the camera up at the beginning of the night, let it run, and check on its progress occasionally. I used at focal of f5.6 and an ISO speed of 1600 ISO for the night sequences. Frame of the time-lapse video “A 2dF night at the Anglo-Australian Telescope”. The Magellanic Cloud rise while the Milky Way sets over the Anglo-Australian Telescope at Siding Spring Observatory on 3 Nov 2011. Some kangaroos can be seen in the ground. Credit: Á.R.L-S. However, the procedure that took more time was processing the hundreds of individual photographies included in each sequence. 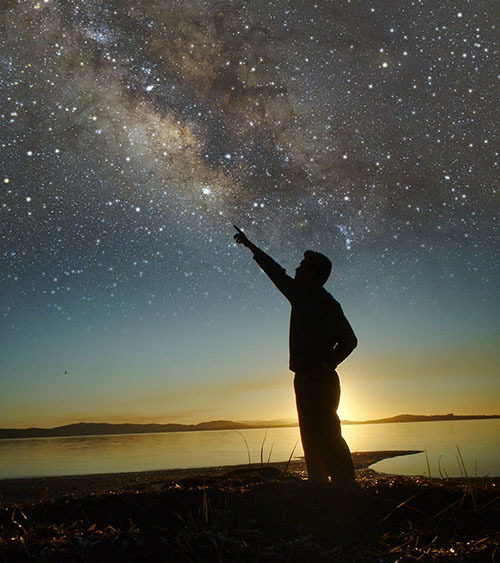 In many cases, I needed more than 12 hours of computer time, including 3 or 4 iterations per sequence, to get a good combination of low noise and details of the sky, plus “cleaning” bad pixels or cosmic rays. In particular, for this video I tried hard to show the colours of the stars, a detail which is usually lost when increasing the contrast to reveal the faintest stars. In the last sequence of the video, Aldebaran and Betelgeuse appear clearly red, while the stars in the Pleiades and Rigel have a blue color. Frame of the time-lapse video “A 2dF night at the Anglo-Australian Telescope”. 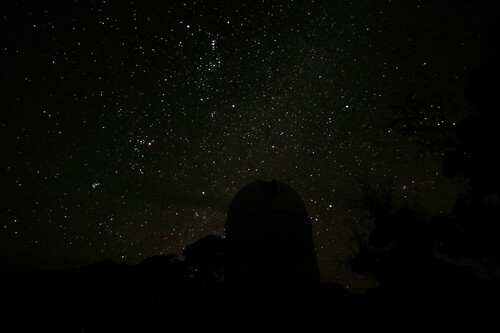 A dark night at The Anglo-Australian Telescope (23 Sep 2011). Orion constellation is seen over the AAT dome. The red colour of Alderaban and Betelgeuse and blue colours of Pleiades and Rigel are clearly distinguished. Credit: Á.R.L-S.
As I did for my previous time-lapse, here I also included a sequence which shows the trails created by the stars as they move in the sky as a consequence of the rotation of the Earth. This sequence shows the Celestial Equator and stars at the South (top) and North (bottom) Celestial Hemisphere. Note that star trails have indeed many different colours. Other details that appear in this time-lapse video are clouds moving over the AAT, satellites and airplanes crossing the sky, the nebular emission of the Orion and Carina nebulae, the moonlight entering in the AAT dome, and kangaroos “jumping” in the ground. Frame of the time-lapse video “A 2dF night at the Anglo-Australian Telescope”. Startrails over the Anglo-Australian Telescope on 23 Sep 2011. The colours of the stars are clearly seen in this image, which stacks 1h 6min of observing time. Credit: Á.R.L-S. Finally, I chose an energetic soundtrack which moves with both 2dF and the sky. It is the theme Blue Raider of the group Epic Soul Factory, by the composer Cesc Villà. Actually, all sequences were created to fit the changes in the music, something that also gave me some headaches. But I think the result was worth all the effort. This entry was posted in Amateur, Astrophotography, Observation, Observatories, Outreach, Profesional, Stars, Timelapses and tagged 2012, 2dF, 2dFGR, AAT, Anglo-Australian Telescope, astronomy, astrophotography, GALAH, GAMA, HERMES, Siding Spring Observatory, SSO, Timelapse, WiggleZ. Bookmark the permalink.